Ya think he's just a wee bit ticked? Witness the rage and intensity! From the action-packed pages of The Incredible Hulk, comes this amazingly detailed Marvel Select Action Figure of the jade giant himself! 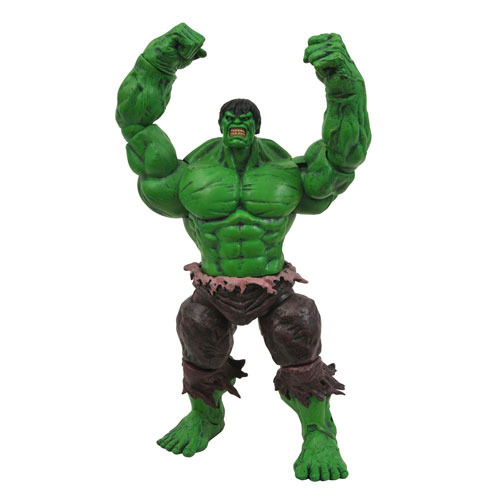 Radiating rage and exuding intensity, this shocking 8-inch tall behemoth includes 14 points of articulation and a deluxe rubble base that exhibits the effects of a Hulk attack. Sculpted by Gabriel Marquez, each rampaging Hulk figure brings a world-shaking mainstay of the Marvel Universe to you... just in time to make (or break) your day. Give yourself a treat by grabbing him while you can! This genuinely "incredible" figure arrives packaged in a blister card.